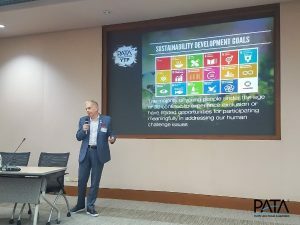 University students along with representatives from the travel and tourism industry came together at the Asia-Pacific Youth and Sustainable Tourism Workshop to examine how the industry can help in achieving the UN Sustainable Development Goals (SDGs). The Asia-Pacific Youth and Sustainable Tourism Workshop, organised by the Pacific Asia Travel Association (PATA) and supported by the Global Peace Foundation and the United Nations Economic and Social Commission for Asia and the Pacific (UNESCAP), took place on Wednesday, March 14 at the United Nations Building in Bangkok, Thailand. Under the theme ‘Setting the Stage for Peace’, the workshop took place in conjunction with the Global Peace Youth Exchange Thailand 2018. The students, who came from various universities in Macao SAR, Austria and Thailand to name a few, began the day with an introduction to the SDGs by Marco Roncarati, Social Development Division – Social Affairs Officer at UNESCAP. He highlighted that the one of the primary focuses of the SDGs was to address the issue of inequality. This was followed by round table discussions between the students and the workshop speakers regarding five SDGs: Zero Hunger, Decent Work and Economic Growth, Sustainable Cities and Communities, Responsible Consumption and Production, and Partnerships for the Goals. The morning session ended with the groups presenting their results and ideas. The afternoon sessions began with PATA CEO Mario Hardy providing an overview of the travel and tourism industry and the upcoming challenges the industry will face, especially regarding human capital development and the future of jobs. The session, under the title Your Ticket to the Theatre of Sustainable Tourism – Setting the Stage for Peace, closed with Dr. Hardy highlighting the importance of supporting the education and training of youth in travel and tourism. The remainder of the workshop was divided into three sessions: The Cast: Ambitious World Explorers, where the speakers shared their reasons and passions in supporting local communities; The Directors: Behind the Scenes of Sleeping, Travelling and Flying, which highlighted the current CSR work of various organisations; and The Indie Producers: Let’s Get Techie, Earthy and Artsy, with speakers giving ideas how new technology can support the SDGs, how education and hands on practices can improve Responsible Consumption and Production, and how important it is that everyone is taking part in responsible actions. Speakers during these sessions included Arrut Navaraj, Managing Director – Sampran Riverside; Gili Back, Sustainability Manager – Khiri Travels; Ivan Cintado, VP Sales and Marketing APAC Region – Smartvel; Kulkanda Pokasem, Director – Alliance Management – Thai Airways International; Madeleine Recknagel, Sustainability Consultant – The Sustainable Self; Mark Wiens, Travel Eater – Migrationology; Michael Biedassek, Explorer/Connector – Bangkok Vanguards; Pai Somsak Boonkam, Founder – Local Alike, and Siradej ‘Champ’ Donavanik, Director – Wonderfruit. Moderators included Mr Roncarati and two Committee Members of the PATA Thailand Dusit Thani College Student Chapter: AnnMarie Kongglang and Warat ‘Moc’ Dittapongpitch, who also acted as the Master of Ceremonies for the day. The workshop ended with the launch of the “BUFFET for Youth”, a challenge targeted at the next generation of tourism leaders that builds on the BUFFET Initiative – a PATA food waste campaign. The announcement was made by PATA Young Tourism Professional (YTP) Ambassador, Ms JC Wong, and PATA Sustainability and Social Responsibility Associate, Ms. Veronika Forstmeier. Photos from the event are available to view and download on the PATA Flickr page, while presentations are available at www.PATA.org/event/asia-pacific-youth-sustainable-tourism-workshop.